West, Ian M. 2012. Purbeck Type Section - Durlston Bay; a Geological Bibliography: Geology of the Wessex Coast. http://www.southampton.ac.uk/~imw/durlbib.htm. Version: 11th October 2012. This is: Bibliography and References. It is part of a series of webpages on Durlston Bay. Go to Purbeck Formation Bibliography? Allen , P. and Keith, M.L. 1965. Carbon isotope ratios and palaeosalinities of Purbeck-Wealden carbonates. Nature, 208, 1278-1280. Anderson , E.J. 2001a. The cyclic structure of the Purbeck Group, Lower Cretaceous, Dorset, England. Abstracts, Geological Society of America, N.E. Section Meeting, Burlington, Vermont, March, p. 67. Anderson, E.J. 2001b. Assymmetrical facies patterns in orbitally forced 3rd, 4th, 5th and 6th order sequences: The Purbeckian of Dorset. Abstracts, SEPM Multidisciplinary Approach to Cyclostratigraphy, Workshop, Sorrento, May, pp. 12-13. Anderson, E.J. 2001c. Integration of bed descriptions, molluscan depth zones and faunicycles with an orbitally forced four-tiered hierarchy of lithic allocycles: In the Lower Cretaceous, Purbeckian of Dorset, England. Abstracts, 21st IAS-Meeting, Davos, September, p. 71. Anderson, E.J., Perry, L.L. and Stynchula, J.A. 2001. Lateral continuity and discontinuity of 100 ka eccentricity sequences within an orbitally forced cyclic hierarchy: The Purbeck Group, Lower Cretaceous, Dorset, England. Abstracts of the Geological Society of America, Annual Meeting, Boston, p. 323. Anderson, F.W. 1973. The Jurassic-Cretaceous transition: The non-marine ostracod faunas. In: R.Casey and P.F. Rawson (Eds.) The Boreal Lower Cretaceous. Seel House Press, Liverpool, Special Issue of the Geological Journal, 5, 101-110. Anderson, F.W. l985. Ostracod faunas in the Purbeck and Wealden of England. Journal of Micropaleontology, 4, pp.l-68. Abstract: The occurrence and abundance of ostracods found in 98 subdivisions (Faunicycles) of late Jurassic to early Cretaceous age in the English Purbeck and Wealden are summarised. Most of the taxa found are illustrated from holotype or other material and details of their ranges and abundance given in relation to each faunicycle. The characters of the ostracod assemblages and zones are decribed. Three new species (Cypriea brendae, C. hispida and Eoparacypris edmundsi) ; also two new subspecies (Cypridea setina pelota and C. tuberculata dorsiclavata) are described and figured. A lectotype for Palaeocytheridea pellucida is selected and figured. Annette, B.M. 1960. Limestone Climbs on the Dorset Coast. Southampton University Mountaineering Club. 36 pp. Also later 2nd and 3rd editions. Deals with Portland Stone rock climbs west of Durlston Bay (superseded by Crewe and later climbing guides). Anonymous . (undated, 1990s?) Swanage. Climbing Guide. 305 pp. One of a series of southwest England and south Wales rock climbing guidebooks. See Crewe, 1977 (It is possible that the copy I have is only second volume and that full author details are in the first. It just has the title - Swanage. Any further information on this would be appreciated). The late Dr William Joscelyn Arkell of Oxford University, famous expert on and author of many publications on the Jurassic System. From a painting commissioned by Shell Oil Co. for an International Symposium on the Jurassic System. 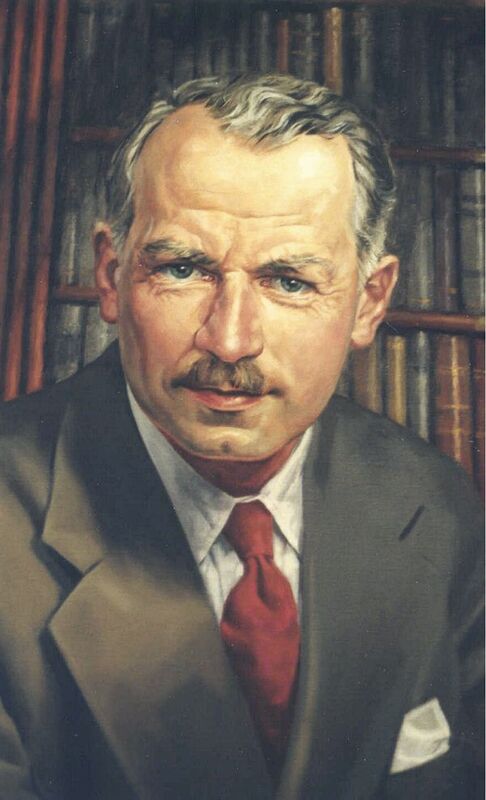 The photograph was kindly provided by the late Professor Michael House who was once a research student of Dr Arkell. Arkell, W.J. 1933. The Jurassic System in Great Britain. Clarendon Press, Oxford, 344p. Arkell, W.J. 1934. Whitsun Field Meeting, 1934, The Isle of Purbeck . Proceedings of the Geologists' Association, 45, 412-419. Report by the Director, W.J. Arkell, M.A., D.Sc., F.G.S. On landing at Studland, the way was first led along the beach northwards and up the new road to the top of the knoll by the Knoll House Hotel. From this view-point the Director gave a short resume of Captain Diver's interesting researches on the origin of Littlesea and the sand dunes spread out below. The first sharp rise ascended by the party was the old sea-cliff of the Eocene beds, which was traceable northwards all along the west shore of Littlesea. The broad belt of sandhills to the east of this consists of blown sand and is a recent accretion, far the most part grown up since the beginning of the Seventeenth Century. There are three main rows or ridges of sand. The first, or inner, ridge is covered entirely by heather and ling and looks from a little distance like the Eocene heath beyond Littlesea; the third or outer ridge is of fresh appearance, tufted only with marram grass. A hogs-back of sand on the beach, already colonised by marram grass, seems to be the embryo of a fourth dune ridge. The Director pleaded far the logical naming of the ridges in the order of their formation, the oldest being called the first, instead of in inverse order as had been done by Captain Diver. He also referred to the richness of these heaths in all forms of natural history products - entomological, botanical and zoological -and to the desirability of preventing, by farming a strong public opinion, their exploitation and permanent defacement for the enrichment of the speculative builder when the present ownership comes to an end. Arkell, W.J. 1941. The gastropods of the Purbeck Beds. Quarterly Journal of the Geological Society, London, 97, 79-128. Arkell, W.J. 1947. reprinted 1953. The Geology of the Country around Weymouth, Swanage, Corfe and Lulworth. Memoir of the Geological Survey, 386 pp. Austen, J.H. 1857. Sections in Durlston Bay based on work of Mr Lester and Mr Fisher. Purbeck Society 1856-7, 116-119. Benfield, E. 1990. Purbeck Shop. A Stoneworker's Story of Stone. Introduction by Brian Bugler. Ensign. [by Eric Benfield]. Bird , E. 1995. Geology and Scenery of Dorset. Ex Libris Press. Bradford on Avon. 207 pp. ISBN 0 948578 72 6. Brannon , P. 1860. The Illustrated and Picturesque Guide to Swanage & the Isle of Purbeck, with a Clear Digest of the Geology and a Minute Description of the Coast from Bournemouth Bay to White Nore. R. Sydenham, Longman & Co., London. 2nd Edition. 106 pp. Brodie , P.B. 1845. A History of the Fossil Insects in the Secondary Rocks of England, Accompanied by a Particular Account of the Strata in Which they Occur, and of the Circumstances Connected with their Preservation. John Van Voorst, Paternoster Row, London. 130 pp. & Plates. This is more concerned with Purbeck insects and isopods ( Archaeoniscus brodiei ) from the Vale of Wardour, Wiltshire and does not contain details of the Durlston section. See the papers of Jarzembowski for Purbeck fossil insects from Dorset. Bristow , H.W. 1856. Comparative Vertical Sections of the Purbeck Strata. Geological Survey of Great Britain, Nos. 1,2 and 3 by H.W. Bristow. No. 4 by the Reverend. Osmond Fisher and H.W. Bristow. Reference maps no. 16 and 17. 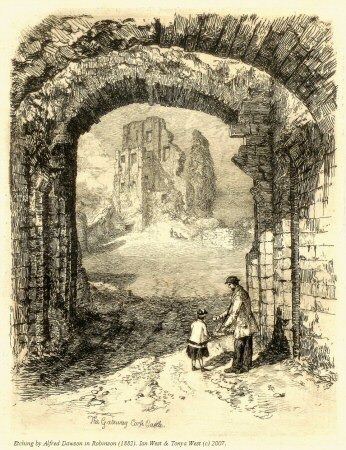 Engraved by J.W. Lowry. No. 1 is the Durlston section by Bristow. Bristow, H.W. and Fisher, O. 1857. Vertical Section, Sheet 22, Geological Survey of Great Britain. Clements, R.G. l973. A Study of Certain Non-Marine Gastropods from the Purbeck Beds of England. Unpublished Ph.D. Thesis, University of Hull, 49l pp. Clements, R.G. 1969. Annotated cumulative section of the Purbeck beds between Peveril Point and the Zig-zag path, Durlston Bay. In: H.S. Torrens (Ed.) International Field Symposium on the British Jurassic, Excursion No. 1, Guide for Dorset and South Somerset. University of Keele, pp. 44-71. 71p. total. Coram, R.A. and Jarzembowski, E.A. (in press). Diversity and ecology of fossil insects in the Dorset Purbeck. In: Symposium, Life and Environments in Purbeck Times, Dorchester, Dorset, 19th-22nd March, 1999. Coram, R. Jarzembowski, E.A. and Ross, A.J. 1995. New records of Purbeck fossil insects. Proceedings of the Dorset Natural History and Archaeological Society, for 1994, 116, 146-150. Crewe, R.J. 1977. Dorset. Climbing Guide. Published by R.J. Crewe. 235 pp. ISBN 0904405044. This mostly deals with rock climbs on the Portland Stone, west of Durlston Bay to St. Aldhelm's Head. The numerous named climbs are on Portland Stone and much detail of rock faces is given. Robert Damon, 1814-1899, was a well-known Dorset geologist and collector of and dealer in fossils. He was born in Weymouth, with origins in a Flemish family. He ran a fossil shop at Augusta Place, the Esplanade, Weymouth. This shop is now a fish and chip shop (information kindly provided by his great, great grandaughter - Carole Burridge - nee Carole Damon, who lives in Bridport). Robert Damon was a Member of the Imperial Natural History Society of Moscow, and visited Russia in 1883, bringing back samples. His books are extremely interesting, with many diverse footnotes and sidelines. Robert Damon made a private collection of 400 Dorset fossils to illustrate his books. The Victoria Museum, Australia has ichthyosaurs from Damon, and many other museums contain fossils of his. Damon , R. 1860. Handbook to the Geology of Weymouth and the Isle of Portland; with Notes on the Natural History of the Coast and Neighbourhood. By Robert Damon. Accompanied by a map of the district, geological sections, plates of fossils, coast views, and numerous other illustrations. London, Edward Stanton, 6 Charing Cross, 1860. This edition is available online in Google Book Search. The second edition, listed below is mostly the same but with some additions. 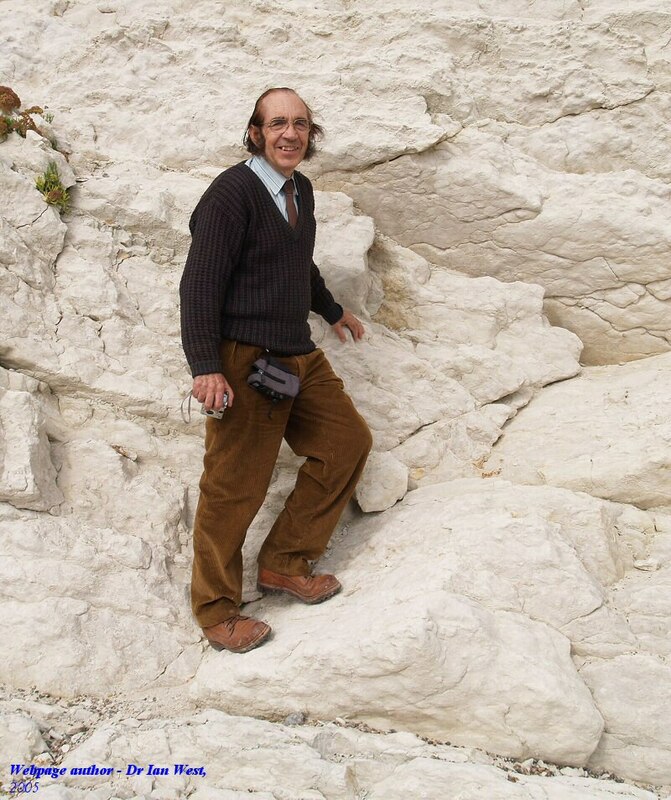 Since the issue of the First Edition increased attention has been given to the Geology of the coast of Dorsetshire, especially in the contributions of Messrs. Blake and Hudleston, and Professor Prestwich, which in part have been embodied in the present volume. Elementary and explanatory notes are given for the use of those young in the study of the science. A description of the geological formations of Swanage and Bridport, the two extremes of the district under consideration, is for more convenient reference placed towards the end. The Geological Survey of this district was almost entirely made by Mr. Henry W. Bristow, Senior Director of the Geological Survey of Great Britain. To him I am greatly indepted for a final revision of the work. Mr. W. Topley, of the Survey, has also kindly given much assistance, as have also Messrs. G. Sharman and E. T. Newton with the lists of fossils. 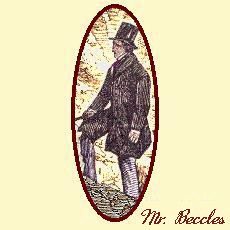 Mr. Etheridge has favoured me with the Bridport portion of his unpublished sections of the Oolitic rocks of England. The works I have consulted are necessarily very numerous, and to their respective authors I acknowledge my great obligations. To the above and other friends, who have kindly responded to my enquiries for information, my sincere thanks are rendered. Davies , G.M. 1956. The Dorset Coast: A Geological Guide. Adam and Charles Black. London. 2nd edition, 128 pages. .
Defoe , D. (Daniel Defoe) 1724. A Tour Through the Whole Island of Britain. Reprinted as Defoe, D., Furbank, P.N., Coulson, A.J. and Owens, W.R. 1991, same title. List: $50.00, Amazon Price: $50.00. Availability: This title usually ships within 2-3 days. Abridged. Hardcover, 417 pages. Published by Yale Univ Press. Publication date: June 1991. Dimensions (in inches): 1.35 x 10.97 x 8.83. ISBN: 0300049803.
de Loriol , P. 1866. Mon. pal. et geol. de l"etage portlandien des environs de Boulogne-sur-Mer. Mem. Soc. Phys. et Hist. nat. Geneve, vol 19, 1866, p. 122, plate 11, figs 13-15. Ensom , P.C. 1988. Excavations at Sunnydown Farm, Langton Matravers, Dorset: Amphibian discovered in the Purbeck Limestone Formation. Proceedings of Dorset Natural History and Archaeological Society, vol. 109, 148-150. Ensom, P.C. 1994a. An unusual tool-mark in the Purbeck Limestone Formation, Durlston Bay, Dorset. Proceedings of the Dorset Natural History and Archaeological Society, 115, 185. Ensom, P.C. 1994b. A new vertebrate trackway from the Intermarine Member, Purbeck Limestone Formation, Dorset. Proceedings of Dorset Natural History and Archaeological Society, 115, 183-184. Ensom, P.C. 1997. Reptile eggshell from the Purbeck Limestone Group of Dorset, southern England. Proceedings of Dorset Natural History and Archaeological Society, for 1996, vol. 118, pp. 79-83. Ensom, P.C. 2002. Vertebrate trace fossils in the Purbeck Limestone Group of Southern England. Pp. 203-220 in: Milner, A.R. and Batten, D.J. (Editors) 2002. Life and environments in Purbeck times. Special Papers in Palaeontology, No. 68, Palaeontological Association, London, 268pp. Abstract: The Purbeck Limestone Group (late Jurassic-early Cretaceous) contains a rich vertebrate trace fossil fauna. Research on this fauna has been almost entirely concerned with dinosaur tracks. By contrast, the feeding traces and coprolites, which are occasionally abundant, have received little attention. The implications of some recent papers, including those where ichnotaxa are assigned, are considered along with the stratigraphic and geographic distribution of reptilian tracks. A plan of the principal footprint horizon at Townsend Road, Swanage, is presented and the more unusual aspects of the site illustrated. An appendix gives a comprehensive listing of published and manuscript accounts dealing with footprints from these strata. Some of the neglected feeding traces and coprolites are described and illustrated for the first time. Ensom, P. 2009. Conchostracans in the Intermarine Member, Durlston Formation, Purbeck Limestone Group, of Dorset, southern England. Proceedings of the Dorset Natural History and Archaeological Society, vol. 130, pp. 234-236. Abstract: The discovery in 2008 of conchostracans Liograpta subquadrata (J. de C. Sowerby) in the Intermarine Member, extends the known range of these extant arthropods from the Lulworth Formation into the Durlston Formation of the Purbeck Limestone Group of Dorset, southern England. Ensom, P.C., Clements, R.G., Feist-Burkhardt, S., Milner, A.R., Chitolie, J., Jeffrey, P.A. and Jones, C. 2009. The age and identity of an ichthyosaur reputedly from the Purbeck Limestone Group, Lower Cretaceous, Dorset, southern England. Cretaceous Research, vol. 30, Issue 3, June 2009, pp. 699-709. Ichthyosaurs are widespread in Mesozoic marine sequences. The marginal marine to terrestrial strata of the Cretaceous Purbeck Limestone Group of Dorset are an unlikely source for the remains of such animals. A specimen in the collections of the Oxford University Museum of Natural History, acquired in the nineteenth century, is recorded as collected from these strata. Despite the suggestion that this specimen might represent a relict taxon of a much earlier lineage in the evolution of ichthyosaurs [Delair, J.B., 1969. The first record of the occurrence of ichthyosaurs in the Purbeck. Proceedings of the Dorset Natural History & Archaeological Society 90, 128�132], its age and source have not been questioned. 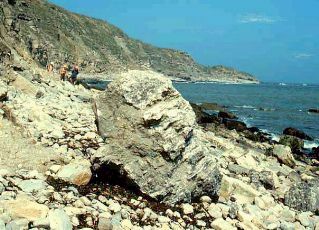 A comprehensive investigation of the matrix, including a palynological study, confirms a Purbeck Limestone Group origin for the specimen. Reassessment of the preserved postcranial skeleton provides evidence that the specimen, though strictly indeterminate, is consistent with attribution to a juvenile of an ophthalmosaurid such as Brachypterygius. The 'notched' phalanx previously considered to be 'primitive' is an artefact of damage to the specimen, either as the slab broke away from the cliff or shore, or during collection and subsequent preparation. Ensom, P.C., Evans, S.E., Francis, J.E., Kielan-Jaworowska, Z. and Milner, A.R. 1994. The fauna and flora of the Sunnydown Farm Footprint site and associated sites: Purbeck Limestone Formation, Dorset. Proceedings of the Dorset Natural History and Archaeological Society, vol. 115, 181-182. Ensom, P.C., Evans, S.E. and Milner, A.R. 1991. Amphibian and reptiles from the Purbeck Limestone Formation (Upper Jurassic) of Dorset. Fifth Symposium on Mesozoic Terrestrial Ecosystems and Biota. Extended abstracts - edited by Zofia Kielan-Jarorowska, Natascha Heintz and Hans Arne Nakrem. Contributions from the Paleontological Museum, University of Oslo, No. 364, 1991. Ensom, P., Kenrick, P., Edmonds, R., Cripps, J. and Hayes, P. 2009. A fossil tree trunk in the Intermarine Member, Durlston Formation, Purbeck Limestone Group of Dorset, southern England. Proceedings of the Dorset Natural History and Archaeological Society, vol. 130, 2009, 183-187. A new and unusual pipe-like feature, that we interpret as a partially exposed fossil tree trunk, has been exposed in the cliffs of Durlston Bay, Swanage. To the best of our knowledge fossil trees have not been recorded from the Durlston Formation of the Purbeck Limestone Group of Dorset. Falconer , H. 1857. Description of two species of the fossil mammalian genus Plagiaulax from Purbeck. Quarterly Journal of the Geological Society, London, 13, 261-282. Falconer, H. 1862. On the disputed affinity of the mammalian genus Plagiaulax . Quarterly Journal of the Geological Society, 18, 348-369. Feist, M., Lake, R.D. and Wood, C.J. 1995. Charophyte biostratigraphy of the Purbeck and Wealden of southern England. Palaeontology, 38, Part 2, 407-442. Abstract: The distribution of charophyte assemblages in the Purbeck and Wealden sequence of southern England has been established from borehole samples from the Weald and from outcrop material collected in Dorset, Wiltshire and the Isle of Wight. Of the twenty-one taxa represented, three are new: Globator rectispirale, Clypeator britannicus and Sphaerochara andersonii; three new combinations are proposed: Globator praecursor, Globator protoincrassatus and Atopochara triquetra. The Chinese Valanginian species Flabellochara xiangyunensis is recognised for the first time in Europe. In the context of the phylogeny of the Family Clavatoraceae, G. rectispirale represents the Jurassic ancestor of the Globatorlineage and a separate origin is suggested for both Flabellochara and Clypeator. The correlation established with the Tethyan realm locate the Jurassic Cretaceous boundary within the Lulworth Formation of the Purbeck Group; in this context, the whole 'Purbeck' sequence of Swindon (Wiltshire) is attributed to the Upper Tithonian. The distribution of the Clavatoraceae indirectly confirms the contemporaneity of the Boreal Galbanites kerberus and Titanites anguiformis with the Tethyan 'Durangites' ammonite zones. For the Wealden Supergroup, the charophyte data affirm the Hauterivian-Barremian boundary near the upper division of the Weald Clay and the Upper Barremian is identified at the base of the Vectis Formation of the Isle of Wight. Garden, I.R. 1991. Changes in the provenance of pebbly detritus in southern Britain and northern France associated with basin rifting. In Morton, A.C. et al. (eds. ), Developments in Sedimentary Provenance Studies. Morton, A.C., Todd, S.P. and Haughton, P.D.W., Geological Society Special Publication, No. 57, pp. 273-289. Heap, W., 1957. The Mammal Bed of Durlston Bay. The Dorset Year Book, 1957-8, pp. 83-85. Heap found Beccles Mammal Pit and Willett's Mammal Pit at the cliff top. He found four mammal jawbones in the cliff exposure at the beach south of the Zigzag Path. Hinchcliffe , J.C. 1978. Death stalks the secret coast. Triton , Vol. 23, no. 2, Feb. 78, p. 56-57. By the diver - John C. Hinchcliffe. Triton Magazine was published by Ecton Publications, 55 High Street, Teddington, TW11 8HA. [about the offshore methane gas seep at Durlston Head] "On the seabed directly beneath Durlston Castle, above whose cliffs is poised the giant stone globe of the world, a further curious phenomenon is found. Here the seabed is bubbling. in 10 metres of water, long columns of bubbles ascend. Some sources are continuous, some spasmodic. I recently collected a sample of this gas and it proved to be an inflammable natural gas. An even more curious phenomenon here is the large numbers of huge bass and pollock which tend to swim about near these bubbles. Do they mistake the hydrocarbon gas for oxygen? Mike Markey drew my attention to this article. He reported (7th Dec. 1990) that the gas seep was still bubbling at that time. He had also found a similar gas seep on the Lulworth Banks (near the axis of the anticline). House, M.E. 1969. The Dorset Coast from Poole to the Chesil Beach. 2nd Edition, Geologists' Association Guides, 22, 32pp. House, M.E. 1993 (and earlier edition in 1989). Geology of the Dorset Coast. Geologists Association Guide No. 22. 2nd edition, 164 pages plus plates. ISBN 0 7073 0485 7. Jarzembowski, E.A. 1993. A provisional checklist of fossil insects from the Purbeck Beds of Dorset. Proceedings of Dorset Natural History Archaeological Society, 114 for 1992. 175-179. . Many are undescribed: about 250 different kinds of beetles are present. 120 species are described; most coleoptera (beetles); many cockroaches, bugs; also lacewings, true flies, dragonflies, grasshoppers and crickets, stick insects, wasps and caddisflies. Jarzembowski, E.A. 1996. Towards a revision of Purbeck insects: Protogryllus, Panorpidum, Pleciomyia and Prohousea Nom. Nov. Proceedings of Dorset Natural History Archaeological Society, for 1995, vol 117, 155-157. Jarzembowski, E.A. and Coram, R. 1997. New fossil insect records from the Purbeck of Dorset and the Wealden of the Weald. Proceedings of Dorset Natural History and Achaeological Society, for 1996, vol.118, 119-124. Authors' Abstract: This paper updates the checklist (Jarzembowski, 1993) and subsequent articles (Clifford et al. 1994; Coram et al. 1995) in previous Proceedings. Recent discoveries are reviewed and Purbeck fossil insects collected by the Revd O. Fisher last century and deposited in the Sedgwick Museum, Cambridge, have been re-examined. Some groups are traced through the non-marine Lower Cretaceous of southern England. (End of Authors' abstract). Bugs, flies etc from the Middle Purbeck of Durlston Bay and dragonfly larvae from the Lower Purbeck of Durlston Bay and Freshwater Bay, Portland. Kielan-Jaworowska, Z. and Ensom, P.C. 1992. Multituberculate mammals from the Upper Jurassic Purbeck Limestone Formation of southern England. Palaeontology, 35, 95-126. Jenyon , M.K. 1985. Fault-associated salt flow and mass movement. Journal of the Geological Society, London, 142, 547-553. Key paper showing structure like that at Durlston Head but not discussing the Purbecks. Kingsley , C. 1857. Geological Discoveries at Swanage. Illustrated London News, Dec. 26th 1857, pp. 637-638. Lee , E.M. 1992. Urban landslides, impacts and management. Pages 80 - 93 in: Allison, R.J. (Ed. ) 1992. The Coastal Landforms of West Dorset. Geologists' Association Guide No. 47. 134 pp. This extract from Lee (p. 8) summarises some accident records: " At Swanage a schoolboy was seriously injured by a rockfall in 1975, a year later another was killed by a falling rock." Legg , R. 1989. Purbeck Island: the industrial, social and natural history of a corner of England. (2nd Revised Edition 1989, first published 1972). Dorset Publishing Company at the Wincanton Press. 230 pp. With interesting details of stone quarrying and old illustrations. Legg, R. Guide to Purbeck Coast and Shipwreck. Lewer , D. - Curiosities of Swanage; or, Old London by the sea. Lewer, D. - Hardy in Swanage : 1875 and "The hand of Ethelberta" by Thomas Hardy. Lewer, D. 1986. The Story of Swanage: A History from Early Times. A Harewood Publications Visitors' Guide. 33 pp. Harewood Publications, 8 Harewood Place, Bournemouth, BH7 6NU. �2.-25p. in 1999. ISBN 0 906596 03 3. (Available in Swanage bookshops). See particularly pages 14-15 - "Quarrying the stone". Lukashevich , E.D., Coram, R.A. and Jarzembowski, E.A. 2001. New true flies (Insecta : Diptera) from the Lower Cretaceous of southern England. Cretaceous Research, 22, 451-460. Abstract: The fossil record of Eoptychopteridae, Ptychopteridae and Dixidae (Insecta; Diptera) is discussed. One new genus and eight new species are described from the English non-marine Lower Cretaceous (Purbeck and Wealden groups): Eoptychoptera longifurcata sp. nov., Eoptychoptera britannica sp. nov., Eoptychopterina demissa sp, nov., Eoptychopterina dimidiata sp. nov., Eoptychopterina camura sp. nov. (Eoptychopteridae), Brodilka mitchelli gen. nov., sp. nov., Zhiganka woolgari sp. nov. (Ptychopteridae) and Eucorethrina westwoodi sp. nov. (Dixidae). Bittacomorphella miocenica (Cockerell, 1910) is transferred to Ptychoptera. Marshall , J.D. 1982. Isotopic composition of displacive fibrous calcite veins: reversal in pore-water trends during burial diagenesis. Journal of Sedimentary Petrology, 52, No. 2, 0615-0630. Abstract: Stable isotope and petrographic analyses of diagenetic calcite ("cone-in-cone" and "beef") veins from British Jurassic and Lower Cretaceous shales have been used to determine the environment of precipitation of fibrous calcites. Successive growth took place by antitaxial displacive addition at the vein margins, away from primary sedimentary laminations or early diagenetic conconcretions. Carbon and oxygen isotopic ratios (del 13 C plus or minus 0 and del 18 O -4 to -11%) indicate a relatively late diagenetic origin for the veins after tens or probably hundreds of metres of burial, and after cessation of bacterial activity and considerable modification of the oxygen isotopic composition of the pore water. Vein growth was discontinuous and took place in waters of changing isotopic and trace-element composition. Changes are not unidirectional and unlikely to result from the simple evolution of a single connate pore water; reversals in isotopic trends indicate that precipitation took place during periods of renewned (lateral?) groundwater flow, tapping different sources of bicarbonate-bearing solution. Milner , A.R. and Batten, D.J. (Editors) 2002. Life and environments in Purbeck times. Special Papers in Palaeontology, No. 68, Palaeontological Association, London, 268pp. Report from a symposium on the Purbeck Formation at the Dorset County Museum, Dorchester, Dorset, March 19-22, 1999. Contains 16 papers and with a preface. Dedicated to the memory of the late Professor Michael House. Price �66. Published December 2002. With 22 plates, 7 tables and 77 text-figures. Nunn , J.F. 1990. A new tridactyl footprint impression in Durlston Bay, Swanage. Proceedings of the Dorset Natural History Archaeological Society, 111, 133-134. Nunn, J.F. 1991. Unpublished Geological Map of Durlston Bay. Nunn, J.F. 1992. A geological map of the Purbeck Beds in the northern part of Durlston Bay. Proceedings of the Dorset Natural History and Archaeological Society, 113, 145-148. Durlston Bay provides the type section of the Purbeck Beds which span the uppermost beds of the Jurassic and the lowest beds of the Cretaceous (AlIen and Wimbledon, 1991). There are many descriptions and measurements of the sequence, starting with Webster (1826) and continuing through Austen (1852) and Bristow (1857). The most complete and accessible vertical section is that of Clements (in Torrens (1969) and the most comprehensive bed-by-bed description is by Clements (1973), with a later vertical section of the middle Purbeck Formation by EI-Shahat and West (1983). Interest in this outstanding coastal section shows no signs of diminishing, and Durlston Bay attracts many geological visitors from all over the world. It is unfortunate that, apart from certain prominent marker horizons, it can be difficult for the stranger to relate some of the bed descriptions to the ground. Neither the 1 :2,500 Ordnance Survey, nor the 1 :50,000 Geological Survey (sheet 343) provides the necessary detail to identify beds from the topography. Strahan prepared a geological survey at a scale of approximately 1:10,000 in 1888 and a second edition was released in1902. However, this provides no more detail than Sheet 343. Perhaps most useful of all is the cliff profile of Strahan (1898,92), subsequently modified by Arkell (1947,136) and House (1989,119). However, at a scale of 1:10,000, it is only possible to indicate the approximate position of a few marker horizons. The present objective has been to prepare maps and cliff profiles of the northern part of Durlston Bay at a scale of 1: 1,000 (here reproduced at 1 :2,500) with full integration of the topography and geology (Figures 1 and 2). The intention has been to make it possible for any visitor to the Bay,equipped with the vertical section, to proceed directly to within a few metres of any particular bed. Also it should now be possible to locate field observations to a ten figure map reference (one metre squares). Nunn, J.F. 1993. Unpublished. Lannen Vein, Devils Bed etc. An excavation at low tide just north of the Slipway Fault, Durlston Bay. Graphic log dated 28/9 August 1992 updated 28th June 1993. Details of beef, micrite, biosparite and tenaceous black shale. Nunn, J.F. 1994. Unpublished notes on the Lower Purbeck Formation, Durlston Bay, 22.12.94. 3 pages. Trenches excavated . Clements' beds 10 to 39..
Owen , R. 1853-89. Fossil Reptilia of the Wealden and Purbeck Formations. Monograph of the Palaeontographical Society, London. Owen, R. 1854. On some fossil reptilian and mammalian remains from the Purbecks. Quarterly Journal of the Geological Society, London, 10, 420-433. Owen, R. 1855. Notice of some new reptilian fossils from the Purbeck Beds near Swanage. Quarterly Journal of the Geological Society, London, 11, 123. Owen, R. 1861. Palaeontology or A Systematic Summary of Extinct Animals and Their Geological Relations. 2nd Edition, Adam and Charles Black, Edinburgh, 463pp. Owen, R. 1871. Fossil Mammalia of the Mesozoic formations. Monograph of the Palaeontographical Society, 33, 1-115. Owen, R. 1874-89. Reptilia of the Mesozoic formations. Monograph of the Palaeontographical Society, London. Owen, R. 1879. On the association of dwarf crocodiles (Nannosuchus and Theriosuchus pusillus e.g.) with the diminutive mammals of the Purbeck shales. Quarterly Journal of the Geological Society, London, 35, 148-155. Owen, R. 1884. History of British Fossil Reptiles. Cassel. London. .
Owen, R. 1894. The Life of Richard Owen. Patterson , C. 1966. British Wealden Sharks. Bulletin of the British Museum (Natural History), 11, 281-350. Popov , Y. A., Coram, R. and Jarzembowski, E.A. 1999 (for 1998). Fossil heteropteran bugs from the Purbeck Limestone Group of Dorset. Proceedings of the Dorset Natural History and Archaeological Society, 120, 73-76. Summary: Our current knowledge of the first fossil heteropteran bugs of the basal Cretaceous Purbeck Limestone Group is summarised and several taxa figured for the first time. The fauna is compared with others of similar age worldwide. End of Summary. - Notes: These are mostly aquatic or semi-aquatic bugs with piercing and sucking mouth-parts. Giant water bugs of the extant predatory family Belostomatidae are known from the Middle Purbecks of Durlston Bay. Aquatic bugs do not occur in some parts of the Soft Cockle Member because of unfavourable hypersaline conditions, and here fragments of terrestrial forms predominate. Pushman , D. 1987. Precious Stone of Dorset. Dorset Publishing Company, Sherborne, Dorset. 128 pp. ISBN 0 902129 937. Extract from Forword by Gareth Thomas. " Some books are hard to pin down. They seem to defy easy classification, and I imagine librarians throughout the country struggling to fit them into their Dew, or whatever other, system. -- This is such a book. It is about a part of Dorset, certainly - its people and its out of the way places; and equally certainly it tells us quite a bit about the business of stone, quarried in Purbeck and on Portland, then shaped and transported to all corners of the country. -- But it is much more than this. For the vision which compelled David Pushman to begin writing is that famous monument of Portland Stone in Whitehall, London - the Cenotaph. -- Where, where are the monuments to the industrial dead?" - Extract from text " The cenotaph is in its way a revelation - the world of the invisible - the great empty tomb of mankind." By Armelle Riboulea, Johann Schnyder, Laurent Riquer, Vincent Lefebvre, Francois Baudin, Jean-Francois Deconinck. Abstract The Purbeck-type section (Durlston Bay, Dorset, UK) exhibits littoral lagoonal to lacustrine facies. It shows a gradual climatic/environmental change from semi-arid conditions associated with evaporites at the Jurassic-Cretaceous transition, to a more humid climate at the end of the Berriasian. Though generally organic-poor (total organic carbon, TOC, less than 1.3%), the Durlston Bay section shows an organic rich episode (TOC up to 8.5%) located at the transition from evaporitic to more humid facies. A biomarker study was performed in order to determine the origin of the organic matter (OM) in the section and if changes in organic sources accompanied the general environmental change. The distribution of alkanes, hopanes and steranes indicates that the origin of the OM is mainly algal/bacterial and only changed moderately with the climatic evolution. The saline and anoxic bottom water conditions indicated for most of the samples point to the recurrence of salinity stratification within the basin. A high contribution of odd numbered C23-C31 n-alkanes from algaenan-containing freshwater algae, in particular Botryococcus, is noted for all the samples, despite the low abundance of these organisms in the corresponding palynofacies. This prominence probably results from the high resistance to degradation and the selective preservation of Botryococcus-related lipids. The subtle balance of aridity and freshwater inputs favoured both an abundance of Botryococcus and the development of anoxia, leading to the enhanced preservation of OM during the intermediate climatic episode, while the conditions were less favourable during the semi-arid and more humid episodes. Analysis of the biomarkers in the apolar fraction of the extracts of nine samples from the Purbeck type section at Durlston Bay (Late Jurassic-Lower Cretaceous, Dorset, UK) was performed. The organic matter (OM) is relatively immature, as revealed by the distribution of alkanes, hopanes and steranes. Its origin is mainly autochthonous, with variable contributions from dinoflagellates, bacteria and freshwater algae, in particular Botryococcus. The contribution of n-alkanes from freshwater algae is high in all the samples, even the most degraded ones, which is attributed to the resistant nature of the lipids produced by these algae. While the sedimentary facies of the Durlston Bay section shows a clear environmental change from evaporitic at the base of the section to more humid conditions at the top, no clear change in primary producers is apparent from the biomarker content. From the distribution of hopanes and presence of gammacerane, hypersaline to saline waters characterise most of the samples, indicating that salinity stratification was amajor process in OM deposition. The gammacerane and homohopane indices show, however, a generally decreasing trend from the base to the top of the section, consistent with the increasing humidity. As proposed by Bohacs et al. (2000) for lacustrine settings, it appears that the best conditions for OM preservation in the estuarine/lagoonal Durlston Bay setting occurred during a period of subtle balance of evaporation and freshwater input. The study has also demonstrated that palynofacies and biomarker analyses are complementary and should be more often associated in palaeoenvironmental studies. Radley , J.D. 1993. An occurrence of Ammobaculites (Foraminiferida, Lituolacea) in the Purbeck Formation (late Jurassic-early Cretaceous) of Dorset, south-west England. J. micropalaeontol, 12, 119-120. Authors abstract: An influx of Ammobaculites cf. obliquus Loeblich and Tappan is documented from the late Jurassic-early Cretaceous Purbeck Formation of Dorset, south-west England. The foraminifera are interpreted as inhabitants of a dysaerobic, muddy, brackish lagoonal environment. Known in the Hauterivian, Valangianian. Also occurs in the Barremian Vectis Formation. Modern forms occur in brackish lagoons of 12.5 to 15 parts per thousand salinity although they tolerate salinity fluctuations. Sometimes inhabit poorly oxygenated mud. A section of the Wimbledon Durlston log is given but is inferior to the Clements' log. Foraminifera in Clements bed DB 168. Robinson , E. 1998. The stones cry out. 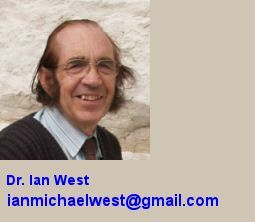 Dorset Geologist's Association Newsletter. April 1998. p. 2-3. With Replies from: Environmental Services, County Hall, Purbeck Stone (Carol Foster, Senior Planning Officer, Minerals and Development Control); and from Kingston Lacey and Corfe Castle Estates, Re. Quarrying (J.C. Homer, Esq., Property Manager - Purbeck Estates). These contributions follow from the leading article in the February edition of the DGAG Newsletter - The demise of a tradition. Robinson, C.E. 1882. A Royal Warren; or Picturesque Rambles in the Isle of Purbeck. Etching Co., London. Ross , A.J. and Vannier, J. 2002. Crustacea (excluding Ostracoda) and Chelicerata of the Purbeck Limestone Group, southern England: a review. Pp. 71-82 in: Milner, A.R. and Batten, D.J. (Editors) 2002. Life and environments in Purbeck times. Special Papers in Palaeontology, No. 68, Palaeontological Association, London, 268pp. Report from a symposium on the Purbeck Formation at the Dorset County Museum, Dorchester, Dorset, March 19-22, 1999. By Andrew Ross, The Natural History Museum, London and Jean Vannier, Universite Claude Bernard Lyon 1, Villeurbanne, France. Abstract: Three orders of Crustacea, apart from the Ostracoda, are represented in the Purbeck Limestone Group of southern England: the Isopoda, Conchostraca and Decapoda. Two species of isopod have been recorded: Archaeoniscus brodiei Milne Edwards and a single specimen of Cyclosphaeroma woodwardi Van Straelen. However, examination of the specimen of C. woodwardi has shown that it is from the Portland Group and not from the Purbeck Limestone Group. Archaeoniscus brodiei is abundant at one horizon just above the Cinder Bed in the Vale of Wardour, Wiltshire, which Brodie called the Isopod Limestone. Four species of conchostracans have been recorded: Liograpta subquadrata (J. de C. Sowerby); L. jurassica Novozhilov; Brachygraptus wardourensis Novozhilov; and Pseudograpta andrewsii (Jones). The order Decapoda is represented by two unidentified species belonging to the families Erymidae and Coleiidae. One chelicerate specimen is known, belonging to the subclass Xiphosuria. Associated ostracods indicate that it came from the base of the Purbeck Limestone Group or the Portland Group. It is identified as Mesolimulus sp. and constitutes the second xiphosuran record for the Mesozoic of the UK. Salter , D.L. and West, I.M., 1965. Calciostrontianite in the basal Purbeck Beds of Durlston Head, Dorset. Mineralogical Magazine, 35, 146-150. Sladen , P.S. 1983. Trends in Early Cretaceous Clay Mineralogy in N.W. Europe. Zitteliana, 10, 349-357. Sladen, P.S. 1984. Source-area environments of late Jurassic and Early Cretaceous sediments in southeast England. Proceedings of the Geologists' Association, London, 95, 149-163. Sorby , H.C. 1860. On the origin of " cone-in-cone ". British Association for the Advancement of Science, Report of the 29th Meeting, 1859. Transactions of Sections, Geology, p. 124. Stevenson , W. 1812. General View of the Agriculture of Dorset. Strahan , A. 1898. The Geology of the Isle of Purbeck and Weymouth. Memoirs of the Geological Survey. Her Majesty's Stationery Office, London. 278 pages with a map and colour cliff sections. Thomas , J. and Ensom, P. 1989. Bibliography and Index of Dorset Geology. Dorset Natural History and Archaeological Society. 102 pp. 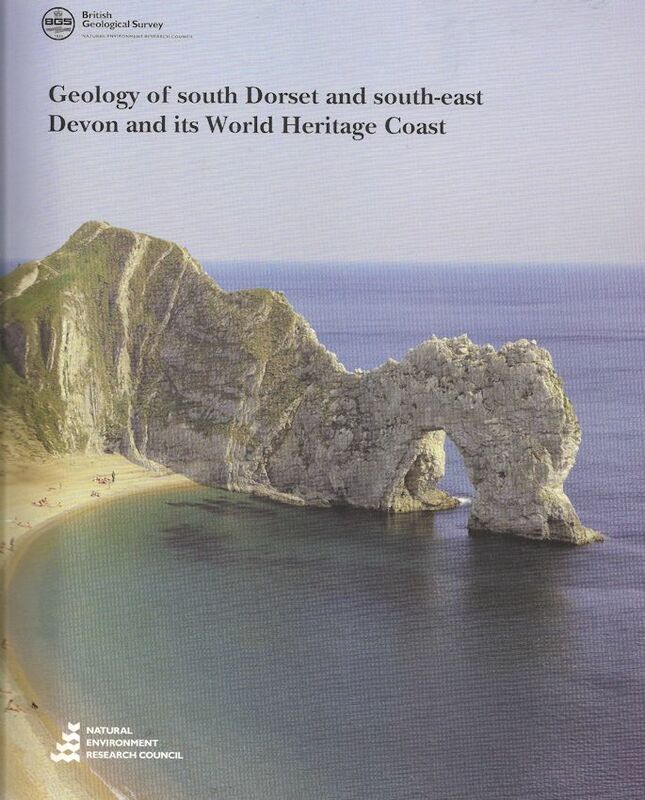 Useful guide to Dorset geological literature including journal articles, newspaper reports and obscure publications. This is now on the Internet. See: Bibliography and Index of Dorset Geology, by Jo Thomas and Paul Ensom, Dorset Natural History and Archaeological Society, 1989. First published in 1989 by The Dorset Natural History and Archaeological Society, Dorchester, Dorset DT1 1XA. Adapted for the World Wide Web in 2002 by John Palmer. � DNHAS, J. Thomas and P. C. Ensom, 1989 and 2002. Webster, T. 1826. Observations on the Purbeck and Portland Beds. Transactions of the Geological Society, London, Second Series, Vol. 2, 37-44 plus plates. This includes a log of the Purbeck building stones of Durlston Bay and a small graphic log of the Purbeck succession of the Isle of Portland. West, I.M. 1964a. Evaporite diagenesis in the Lower Purbeck Beds of Dorset. Proceedings of Yorkshire Geological Society, 34, 315-330. [Petrographic evidence of vanished evaporites in the Caps and Broken Beds - pseudomorphs, celestite, lutecite etc. Diagenetic history established.] 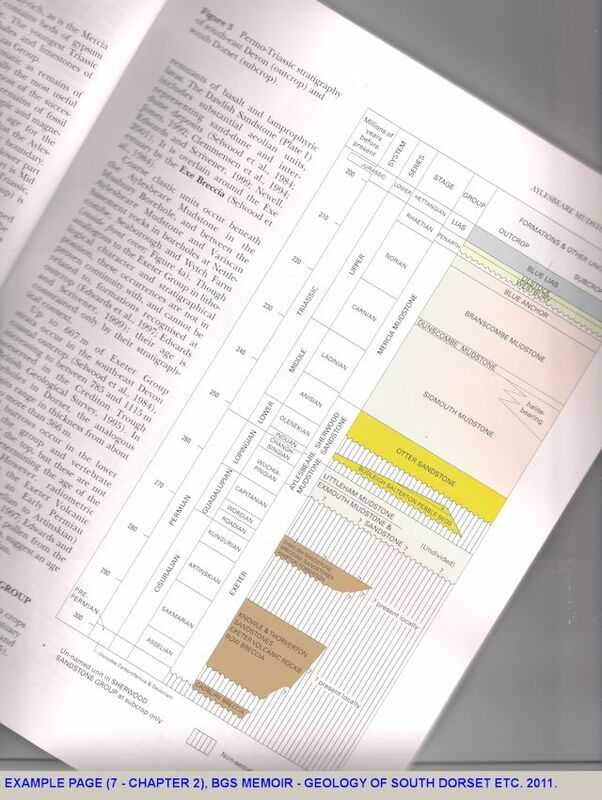 Abstract: Five stages have been determined in the diagenetic history of the calcium sulphate beds of Lower Purbeck age in Dorset, particularly by reference to abundant pseudomorphs and other relict textures and structures preserved in late-formed gypsum and in secondary silica and calcite. The weight of the overburden is thought to have controlled the changes. Occurrences are described of minerals, including celestite, calciostrontianite, lutecite and quartz remaining after the removal in solution of gypsum. A description is also given of secondary limestones which occur particularly in the Caps and Broken Beds. They are shown to be almost entirely replacements of original sulphate deposits. West, I.M. 1979. Sedimentary Environments and Diagenesis of Purbeck Strata (Upper Jurassic - Lower Cretaceous) of Dorset, U.K. Unpublished Ph.D. Thesis, Southampton University, 181 p. Abstract: Twelve papers, notes and a contribution to a book, all either published or accepted for publication, constitute this thesis. All parts of the classic, shallow-water, schizohaline Purbeck Formation of the type area are discussed but emphasis is on Lower Purbeck evaporites. Diagenesis of these involved much conversion of initial small lenticular crystals of gypsum to anhydrite with net-texture. The anhydrite was extensively replaced by calcite and celestite in the Broken Beds, a tectonic evaporite breccia at the base of the Purbecks. Evaporites were almost completely lost in solution from this breccia leaving characteristic relics of "vanished evaporites". Elsewhere, in the more argillaceous parts of the formation the sulphate remains, mainly as porphyrotopic secondary gypsum. Nodules and enterolithic veins are abundant in both the calcium sulphate and in the replacements. The similarity to those in Holocene sabkhas of the Trucial Coast (Shearman, 1966) suggested an origin on supratidal sabkhas, but there is a lack of desert sediments and instead the evaporites are interbedded with forest soils. Analogous Carboniferous evaporites show evidence of sabkha origins but no sign of desert conditions [West, Brandon and Smith, 1968. A tidal flat evaporitic facies in the Visean of Ireland. Journal of Sedimentary Petrology, 38, 1079-1093.]. New evidence has come from sabkhas in Northern Egypt where gypsum nodules develop in partly vegetated environment, dry but not excessively so, and supports other evidence for a semi-arid origin for the Lower Purbeck evaporites [West, Ali and Hilmy. 1979. Primary gypsum nodules in a modern sabkha on the Mediterranean coast of Egypt. Geology, 7, 354-358.]. The relatively dry climate was temporary and facies of higher parts of the Purbecks seem to result from sub-humid conditions. Throughout the formation lagoonal, 'intertidal' and supratidal deposits can be recognised but in the Middle and Upper Purbecks the lagoonal sediments have abundant brackish shelly faunas and, there, 'tidal-flat' deposits consist of shell-sand with dinosaur footprints but usually without evaporites. Progressively the proportion of land-derived clastics such as kaolinite and quartz sand increases as the continental Wealden is approached and final Purbeck sediments contain debris eroded from the underlying Portland Stone Formation, then uplifted at the western margin of the basin. West, I.M., 1979b. Review of evaporite diagenesis in the Purbeck Formation of southern England. Symposium - Sedimentation Jurassique W. Europeen. A.S.F. Publication Speciale, No.1, Mars 1979. pp. 407-416. West, I.M. 1988 Notes on some Purbeck sediments associated with the dinosaur footprints at Sunnydown Farm, near Langton Matravers, Dorset. Proceedings of the Dorset Natural History and Archaeological Society, 109, 153-154. West, I. M. 1992. 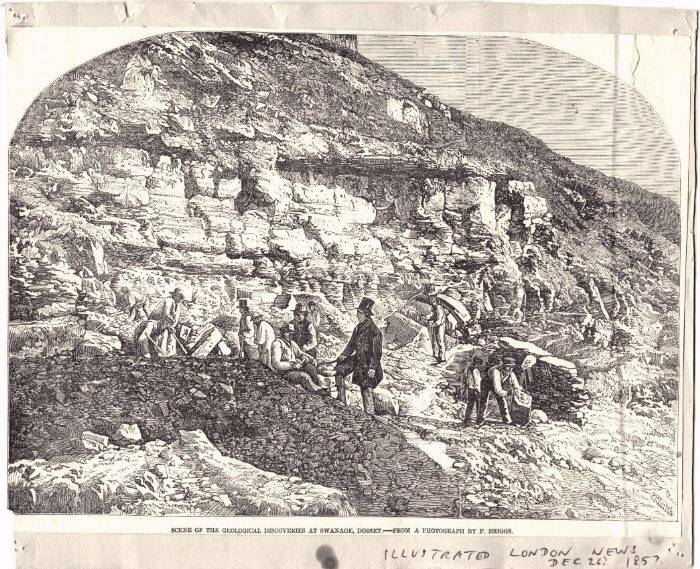 Contribution on Purbeck Formation in: Cope, .J C.W., Ingham, J. K. and Rawson, P.F. (editor). 1992. Atlas of Palaeogeography and Lithofacies. Geological Society of London. Wimbledon , W.A. 1987. Rhythmic sedimentation in the Late Jurassic-Early Cretaceous. Proceedings of the Dorset Natural History and Archaeological Society, 108 for 1986, 127-133. Most of this paper is on the Portland Group but an Appendix refers to Purbeck nomenclature. Abstract: A number of shallowing and deepening phases is described in the late Kimmeridgian - Berriasian interval. Eleven deepening / transgressive events are noted in the most complete Dorset section. A preferred lithostratigraphy for these beds is compared to previous lithostratigraphy, and "event correlations" are critically examined. Woodward , H.B. 1890. The Geology of Swanage. pp. 63-82 in: Braye, J. 1890. Swanage (Isle of Purbeck): Its History, Resources as an Invigorating Health Resort, Botany and Geology. 2nd Edition. William Henry Everett and Son, Salisbury Square, Fleet Street, London, 119 pp. (John Bray). Price One Shilling. Woodward, H.B. 1907b. Stanford's Geological Atlas of Great Britain and Ireland; with Plates of Characteristic Fossils. Preceded by descriptions of the geological structure of Great Britain and Ireland and their counties; and of the features observable along the principal lines of railway. Edward Stanford, London. Pp 189 & Plates. (This is a reference from which images are derived rather than a publication of much direct relevance to Durlston Bay). Copyright © 2012 Ian West, Catherine West, Tonya West and Joanna Bentley. All rights reserved. This is a purely academic website and images and text may not be copied for publication or for use on other webpages or for any commercial activity. A reasonable number of images and some text may be used for non-commercial academic purposes, including field trip handouts, lectures, student projects, dissertations etc, providing source is acknowledged.